POISON‘s reunited original lineup — Bret Michaels, Bobby Dall, Rikki Rockett and C.C. DeVille — kicked off its North American tour with DEF LEPPARD last night (Saturday, April 8) at the SNHU Arena in Manchester, New Hampshire. 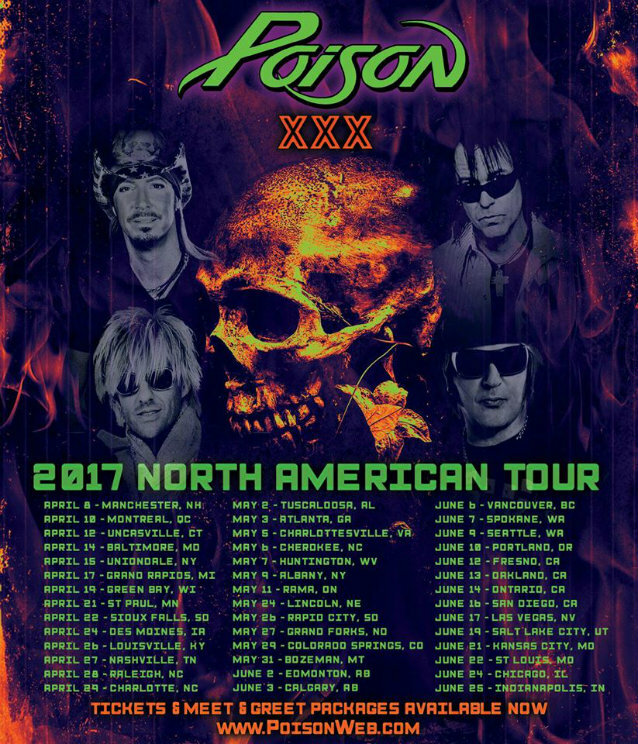 POISON‘s tour with DEF LEPPARD will wrap on June 25 in Indianapolis, Indiana. POISON and DEF LEPPARD first hit the road together back in 2009, and then again three years later. The band hasn’t done any major touring since taking part in the 2012 “Rock Of Ages” trek with DEF LEPPARD and LITA FORD. Rockett was recently declared cancer free after undergoing an experimental treatment. He was diagnosed with oral cancer back in 2015.